Physalis alkekengi is mainly known as the lantern plant. It is a perennial and a member of the nightshade family (Solanaceae). The name Physalis means bladder-shaped, which refers to the lantern-shaped chalice containing a berry. The actual flowers are white and pretty insignificant, but the orange lanterns are irresistible! The Physalis plant is prone to running wild; its root system goes everywhere. As a cut flower, Physalis is very suitable for adding a touch of wildness to a bouquet. 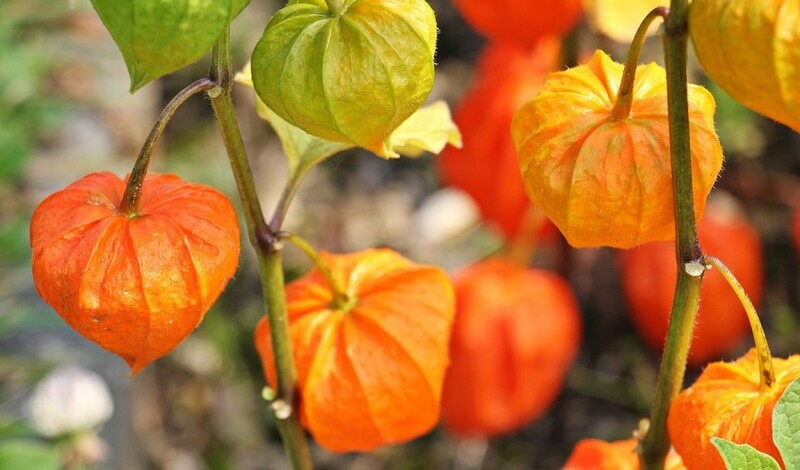 Physalis is available from early August to mid November both with and without leaf, and as individual lanterns. The usual care tips apply to Physalis: cut off the tip of the stem, if necessary, trim off some leaves and put the flowers in clean water with floral preservative. The lanterns are also easy to dry. The story of the field : "We harvest all the Physalis by hand." The Physalis' luxuriant inflorescences easily get blown every which way; wire is used to keep them in place. In the summer, the plants develop little white flowers. Let the bees do their job! The latter ensure pollination turning these modest little blooms into wonderful lanterns. These slowly change colour from green to bright orange. If the sun breaks through, the field turns into a party. “We harvest Physalis in the early morning when the sun has just come up, the dew is still on the crop and you breathe in that fresh outdoor smell. If the plants are in good shape, I really feel happy”, says grower Frendo van Heybeek.